I have a secret, I’m obsessed with Bon Appetit’s cooking videos. They have not only the best tasting pasta dishes (and much more), they also have multiple incredible chefs. My personal favorite chef is Molly Baz, she gives you all the amazing tips that will help you level up your cooking abilities while producing delectable dishes. Molly also created this beautiful recipe highlighted here. The picture above is the results of a very very happy Monday for myself and my two children. My son Maxwell asked for second helpings and myself, I ate that entire plate pictured above (Wanting more). I’m highly encouraging you all to check out the Bon Appetit link here to their Facebook show TEST KITCHEN RECIPES . Inside the show you will find a video where Molly make this AMAZING Mushroom Carbonara. 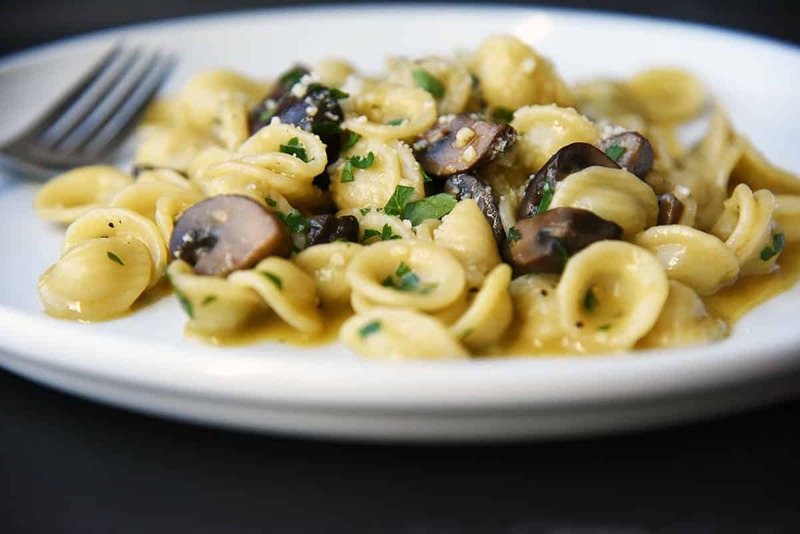 The orecchiette aids in scooping up all the little bits of sauteed shallots and garlic. The mushrooms gives you a flavor of pure bliss all coated in a luscious creamy sauce. Plain and simple, this is my new favorite pasta dish that I will be making over and over again. Typically, I end up tweaking new recipes but not this one. Thank you sincerely Molly.